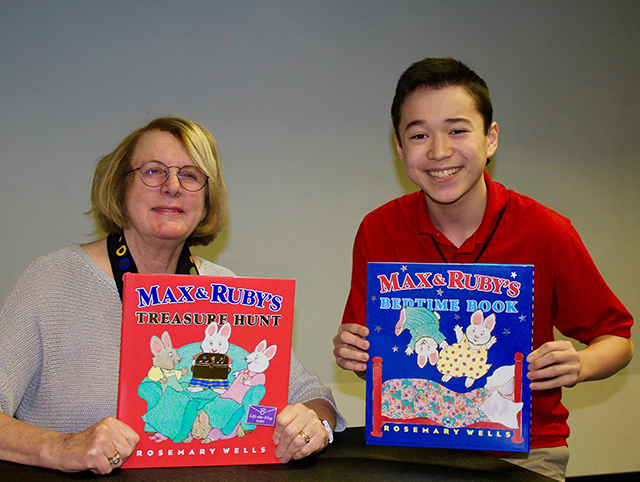 Rosemary Wells: Bunnies and Books | Kid Reporters' Notebook | Scholastic Inc.
Maxwell and author Rosemary Wells hold copies of her picture books at the Wellesley Free Library in Massachusetts. “Picture books are important because they’re full of fun, joy, wonder, and beauty,” says children’s book author and illustrator Rosemary Wells. On March 7, Wells presented her work to kids, parents, and teachers at the Wellesley Free Library in Massachusetts. She has published 130 picture books and counting. “I love to draw animals, and I draw them very well,” said Wells, whose career spans 45 years. Her next book, Sleep, My Bunny (Candlewick), is due out in November. Wells is best-known for her Max & Ruby series, which follows the adventures of sibling bunnies. Her inspiration came from her two daughters, who are now grown with daughters of their own. When the older one was 5, she was talking in 3- and 4-word sentences. She had a bossy personality like Ruby’s. The younger one, at 9 months, didn’t say a word. But she raced around the house like Max. Wells would listen to the girls’ conversations, which sparked ideas for her books. At the library, Wells read Hand in Hand, a picture book depicting the many ways that parents—even furry ones—nurture their children. “I wrote the book to encourage all parents to be their child’s first teacher,” she said. She talked about the importance of reading aloud to children to provide them with calmness and stability. Wells draws or paints for 10 minutes every morning in her Norwalk, Connecticut, studio. She compares her routine to that of a pianist or violinist practicing his or her scales. “I do this in order to have a sharp eye and steady hand,” said Wells, whose books are filled with mice, raccoons, bunnies, and geese.